In his In the blink of an eye, Walter Murch, the Oscar-awarded editor of The English Patient, Apocalypse Now, and many other outstanding movies, devises the Rule of Six — six criteria for what makes a good cut. On top of his list is “to be true to the emotion of the moment,” a quality more important than advancing the story or being rhythmically interesting. The cut has to deliver a meaningful, compelling, and emotion-rich “experience” to the audience. Because, “what they finally remember is not the editing, not the camerawork, not the performances, not even the story—it’s how they felt.” Technology for all the right reasons applies this insight to the design of interactive products and technologies — the domain of Human-Computer Interaction, Usability Engineering, and Interaction Design. It takes an experiential approach, putting experience before functionality and leaving behind oversimplified calls for ease, efficiency, and automation or shallow beautification. Instead, it explores what really matters to humans and what it needs to make technology more meaningful. The book clarifies what experience is, and highlights five crucial aspects and their implications for the design of interactive products. It provides reasons why we should bother with an experiential approach, and presents a detailed working model of experience useful for practitioners and academics alike. It closes with the particular challenges of an experiential approach for design. The book presents its view as a comprehensive, yet entertaining blend of scientific findings, design examples, and personal anecdotes. A sample can be found at issuu! This is a brilliant book, written in a lively, engaging style that gets to the essence of experience design. 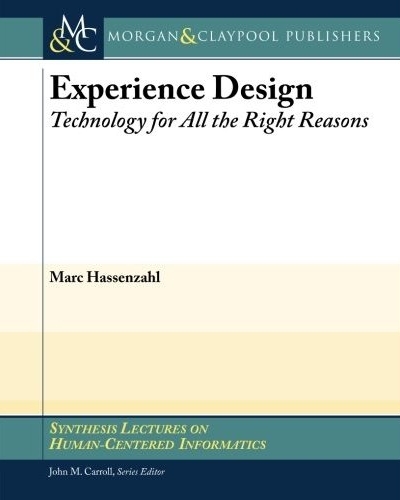 This book should be required reading for designers: experience designers, human-computer interaction designers, user-interface designers, graphical designers, and industrial designers. It moves us beyond the basics and fundamentals toward the higher levels of human values and needs. The examples demonstrate how the ideas can be applied. Who should read it? All technologists and all psychologists who wonder how science can contribute to design. All engineers, who wonder what that soft, mush concept called “experience” has got to do with the products they build. Marc Hassenzahl is Professor of “User Experience and Ergonomics” at Folkwang University in Essen, Germany. What a delightful title for a professorship! But then again, the book is delightful, full of deep psychological theory and insight, but written in such a way that you don’t notice it unless you wish to. And who said it? Check!